This high-resolution scanning electron microscope image shows the microstructure of boron-doped Q-carbon. Image: Jay Narayan. Researchers at North Carolina State University have significantly increased the temperature at which carbon-based materials can act as superconductors, using a novel, boron-doped Q-carbon material. The previous record for superconductivity in boron-doped diamond was 11K (-262°C). The boron-doped Q-carbon has been found to be superconductive from 37K to 57K (-236°C to -216°C). 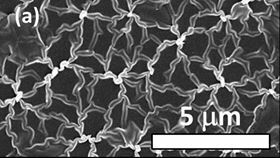 "Going from 11K to 57K is a big jump for conventional BCS superconductivity," says Jay Narayan, professor of materials science and engineering at NC State and senior author of two papers describing the work in the Journal of Applied Physics and ACS Nano. BCS refers to the Bardeen-Cooper-Schrieffer theory of superconductivity. Regular conductive materials conduct electricity, but a lot of that energy is lost during transmission. Superconductors can handle much higher currents per square centimeter and lose virtually no energy through transmission. However, superconductors only have these desirable properties at low temperatures. Identifying ways to achieve superconductivity at higher temperatures – without applying high pressure – is an active area of materials research. To make the boron-doped Q-carbon, the researchers coat a substrate with a mixture of amorphous carbon and boron, and then fire a single laser pulse, lasting just a few nanoseconds, at the mixture. During this pulse, the temperature of the carbon is raised to 4000K and then rapidly quenched. "By incorporating boron into the Q-carbon we eliminate the material's ferromagnetic properties and give it superconductive properties," Narayan explains. "So far, every time we have increased the amount of boron, the temperature at which the material retains its superconductive properties has increased. "This process increases the density of carrier states near the Fermi level," relative to boron-doped diamond, Narayan says. "The materials advance here is that this process allows a boron concentration in a carbon material that is far higher than would be possible using existing equilibrium methods, such as chemical vapor deposition," he adds. "Using equilibrium methods, you can only incorporate boron into Q-carbon to 2 atomic percent – two out of every 100 atoms. Using our laser-based, non-equilibrium process, we've reached levels as high as 27 atomic percent." That higher concentration of boron is what gives the material its superconductivity characteristics at a higher temperature. "Oak Ridge National Laboratory has confirmed our findings about higher density of states using electron energy loss spectroscopy," Narayan says. "We plan to optimize the material to increase the temperature at which it is superconductive. This breakthrough in high-temperature superconductivity of Q-carbon is scientifically exciting with a path to room temperature superconductivity in novel strongly bonded, light-mass materials. The superconductivity in Q-carbon has special significance for practical applications, as it is transparent, superhard and tough, biocompatible, erosion and corrosion resistant. Nothing like that exists today. "There are already closed-cycle helium refrigeration systems designed for use with superconductors that can achieve temperatures easily as low as 10K," Narayan says. "B-doped Q-carbon can handle as much as 43 million amperes per square centimeter at 21K in the presence of a two Tesla magnetic field. Since we have demonstrated superconductivity at 57K, this means the doped Q-carbon is already viable for applications."